2. In a large bowl or stand mixer, cream butter and sugar, then beat in eggs, one at a time. Sift in flour, baking powder, and salt, stir to combine. Pour in milk and both extracts, mix until fully combined and smooth. 3. Grease three 9” pans and pour batter evenly into each pan. Bake at 350 degrees for 25 to 30 minutes. Test by placing a toothpick into the center of the cake. If it comes out clean, the cake is done. 4. Place pans on top of a cake rack and let cook for a few minutes in the pan. Flip over to remove and let the cakes cool to room temperature. 1. In a stand mixer fitted with a whisk attachment (or in a large bowl with a handheld mixer), beat the butter on high for 1 ½ minutes. Reduce speed to low and begin adding sugar, 1 cup at a time.Once you’re sure the sugar won’t fly everywhere, increase the mixer speed to high. Beat until all the sugar has been added and is well incorporated. 2. Add the vanilla extract and beat for 2more minutes until the frosting is light and fluffy, but still holds its shape. 3. Pull apart the Oreo’s, removing the cream filling and place the chocolate cookies into the bowl of a food processor. Pulse several times until the pieces are ground into a rough,gravel-like texture. 4. Level each cake with a serrated knife or wire, removing the round tops to create a flat surface. 5. Place strips of wax paper along the bottom of the cake plate or tray and place the first layer of cake on top (this way, once there’s a mess at the end, you can simply remove the wax paper and you’ll be left with a spotless surface). Dollop a good amount of frosting(about ½ cup) into the center of each cake, then take an offset spatula to slowly spread the frosting evenly around the surface. 6. Sprinkle a ½ cup of crumbled cookie across the first layer of cake, spreading it evenly across the surface, thena dd the next layer of cake. 7. 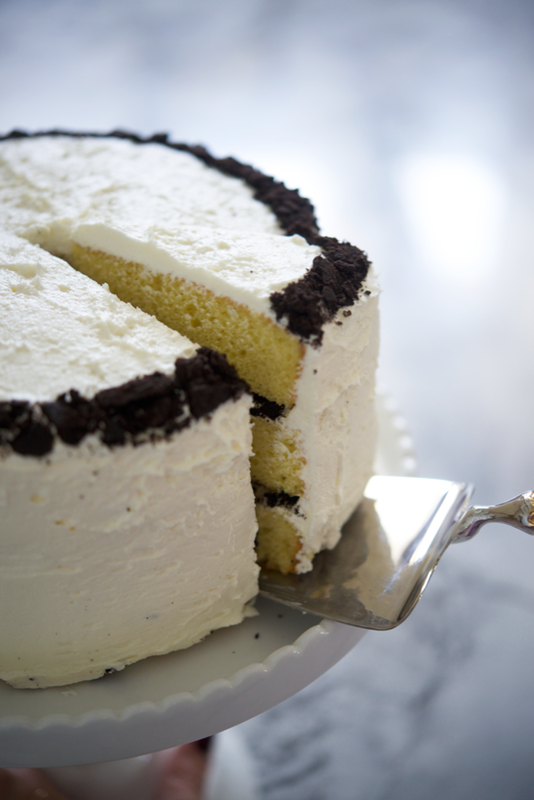 Repeat the frosting and cookie process on the next two layers, making sure the very top layer only has frosting. 8. Frost the sides of the cake. 9. Trace a circle on a piece of wax paper that’s a few inches smaller than the diameter of the cake. 10. Lightly place the circular piece of wax paper in the middle of the cake. Sprinkle the cookie crumbs so that it falls just along the outer rim of the top of the cake. 11. Carefully peel away the wax paper and smooth the surface again with the offset spatula.